Arrive in East Berlin at about 7:15am, it is raining hard and it's damn cold! Good start! The city center is clean and every corner is almost manicured. First things first, we climb on top of the Fernsehturm, the long TV tower that is a point of reference for anyone moving around East Berlin. Built between 1965 and 1969 it is the tallest structure in all of Germany (NOTE in 2015: it still is!) and a symbol of pride for the authorities of the Germand Democratic Republic (GDR). Unfortunately because of the weather we can't see much from the top: it no longer rains but we can see just clouds and fog. As we descend and walk around we discover that not all parts of the city are as spotless as we thought after our first impression around the station: many streets are dirty, they qualify for the title of slums really. A few churches are available in this most strict Communist dictatorship. Re-built after the war, they are empty shells of bricks and concrete. No decorations. Only a few pieces of low-relief sculptures are on display, recuperated from the pre-war works. We then visit the Palace of Culture and the History Museum, both places replete with vicious attacks against the West in every shape or form: posters, caricatures. 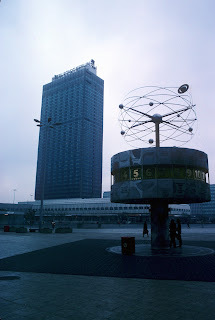 We then try to cross the wall into West Berlin on foot, but we are not allowed to do so, can do only by metro, crossing at the Friedrichstrasse station. This is a unique station because it is in East Berlin but it is served by West Berlin metro, allowing for a more easily controlled border crossing. The old pre-war German metro is still functioning but of course it is divided. 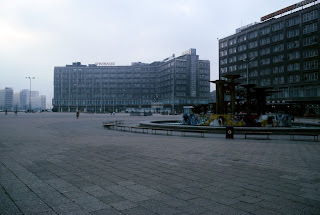 Some stations had to be closed as the trains travel under West Berlin to go from one part to another of East Berlin. 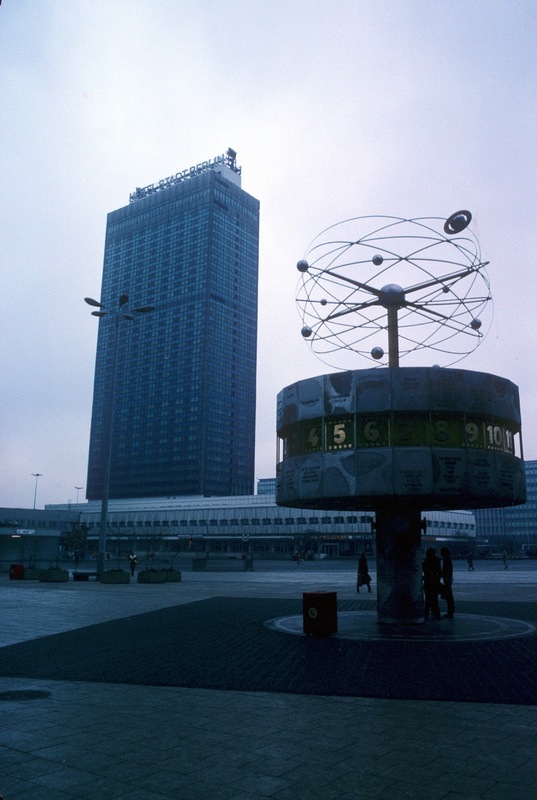 When we arrive in West Berlin we start looking for a place to stay, and walk around the shining city for many kilometres. Very expensive for us after we have gotten used to Polish prices! Finally we find a mediocre room in the Buchenwald Pension for DM 26 per day. We are very tired and collapse soon after eight o'clock, and will sleep for a solid twelve hours.